Member of the Brassicaceae or Cruciferae (mustard family). 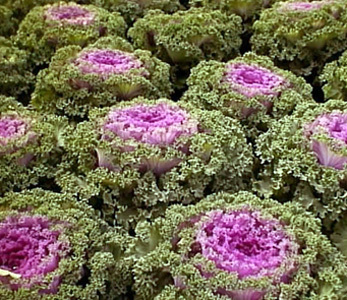 Related species include cauliflower, Brussels sprouts, kohlrabi and broccoli. Ruffled leaves occur in a rosette on a thick stem. Odor of plant parts may be offensive. The variety name “acephala” means headless. The specific epithet name “oleracea” generally means of the garden. Cruciferae means cross, referring to the flower petals positioned as a cross. In obvious reference to Jesus and the crucifix. Color of leaves can vary from shades of green to cream or purple.